Cold but good April dive! Sunday, the NOAA forecast was right, but a little late. They called for 2 foot seas from the Northwest. On the way out, we kept watching behind us as waves were building. We figured we would make a call at 10 miles, at that point we were still in 3-4, so we made a dash for the parking lot. On arrival, the seas were 3-5, with a steady wind from the northwest. This was not representative of the forecast, but was still quite manageable. We had some new crew members on the trip, so it was a good trip for some training. Bill had us over the wreck, and we jumped in and headed down. Given the length of line that payed out, the shot was assumed to be in the sand. As it turned out, it was the mid water current that was to blame for the line. Dropping down the line, the direction changed several times. The vis was good, and I could see the changes below me. First it went to the right, then to the left. I was tempted to just drop past the loops to the line below me, but did not want to let go. When we finally hit the wreck, the line was laying over the hull, with the shot somewhere below us. The vis was 40 + , and the line draped over one of my favorite spots, with the shot off in the distance. I did a few wraps to mark the way back, and we headed down to find the shot, that we assumed was in the sand. Luck was on our side, and the grapnel had caught up on the undergrowth. We dropped down and quickly shot it back to the surface. After hauling the chain and line back up to the top of the wreck, I let the new crew wrap it for the tie. With a few minor corrections, we were done. No way we would pull out like other boat have done lately. The pool was open. It was safe to dive. We listening carefully to the engines above, as we dropped down to the bottom. We could clearly hear the Independence maneuvering, then shutdown (they were in, without issue). I was looking for lobster, but did not see any indications of the tasty crustacean. Instead, I kept running across scallops. Last year we saw a lot of small scallops close to, even on top of the wreck. However, the ones we saw today were much larger. With the bottom temps at 38 degrees, I’m not surprised that there was not much moving. I looked off into the sand, but there was nothing there. Normally we see loads of winter flounder, and a few scallops, but there was nothing off in the distance. During the dive I saw on small Black fish, and lots of cunners, and the the occasional ling cod, but little else. No one else saw any evidence of lobster. Either the wreck had been cleaned out recently, or they are not active yet. At 38 degrees, I cooled off quickly, and we headed back up. After a short deco, we were soon back on board. Topside, the wind was dying down, and after a bit the waves did also. By the time we headed back, the NOAA forecast was becoming accurate. Several of us were suffering some first dive equipment concerns, and decided to make it a on dive day. Nothing dangerous, just no need for a second dive. Most passengers did two dives, and we were soon on our way back home. 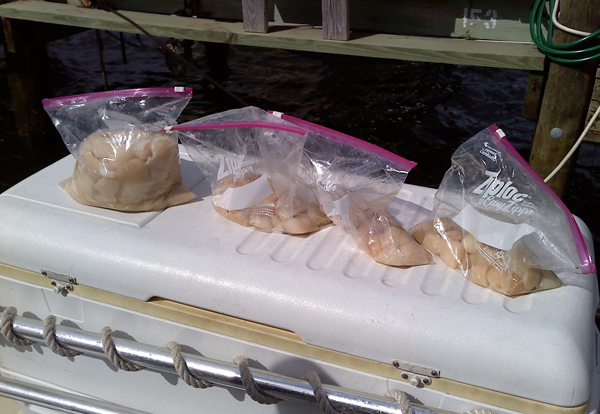 It was a great start to the season, everyone had a great dive, and a bag of scallops to prove it. 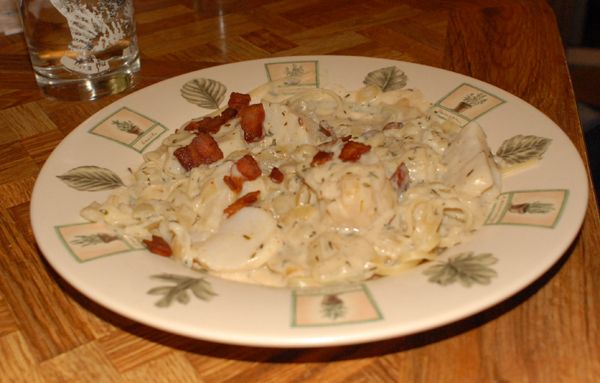 My wife, Valerie (1000 ways to cook fish) Oldham did herself proud, and made a fantastic scallops and pasta dish. Given the rough seas, I did the Advil thing. Many people do not understand that standing on a boat for several hours adjusting you center of gravity uses a lot of muscles that you do not use every day. It can be a work out. Today it was. For those of us in the over 40 club, advil is a great help the first couple of times. Well despite the forecast, it was a great day. Personally, I’m looking forward to a fantastic season! Dive season is open. Lets go diving!